"Nanatsu no Taizai" redirects here. For Hobby Japan's media franchise of the same name, see Seven Mortal Sins. First volume of The Seven Deadly Sins, released in Japan by Kodansha on February 15, 2013. The Seven Deadly Sins (Japanese: 七つの大罪, Hepburn: Nanatsu no Taizai) is a Japanese fantasy manga series written and illustrated by Nakaba Suzuki. It has been serialized in Kodansha's Weekly Shōnen Magazine since October 2012, with the chapters collected into thirty-six tankōbon volumes as of March 31, 2019. The manga features a setting similar to the European Middle Ages, with its titular group of knights representing the seven deadly sins. The manga has been licensed by Kodansha USA for English publication in North America, while the chapters are released digitally by Crunchyroll in over 170 countries as they are published in Japan. As of 2018, The Seven Deadly Sins has over 28 million copies in circulation. It was adapted into a 24-episode anime television series by A-1 Pictures that aired from October 5, 2014 to March 29, 2015 in Japan. A second season aired from January 13, 2018 to June 30, 2018. An anime film was released on August 18, 2018. A third season by Studio Deen will premiere in October 2019. Netflix acquired the exclusive English streaming rights for the anime series while Funimation currently has the home video rights. The Seven Deadly Sins were once an active group of knights in the region of Britannia (ブリタニア, Buritania), who disbanded after they supposedly plotted to overthrow the Liones Kingdom (リオネス王国, Rionesu Ōkoku). Their supposed defeat came at the hands of the Holy Knights, but rumors continued to persist that they were still alive. Ten years later, the Holy Knights staged a coup d'état and captured the king, becoming the new, tyrannical rulers of the kingdom. The third princess, Elizabeth, then starts out on a journey to find the Seven Deadly Sins and enlist their help in taking back the kingdom from the Holy Knights. Written and illustrated by Nakaba Suzuki, The Seven Deadly Sins began as a one-shot pilot chapter published on November 22, 2011 in Weekly Shōnen Magazine's 52 issue of the year. The manga started serialization in the magazine's 45 issue of 2012, released on October 10, 2012. The chapters have been collected into 31 tankōbon volumes as of April 17, 2018. The first of three planned story arcs was completed with chapter 100 and Suzuki has projected that the series will run for 20 to 30 volumes. The series is licensed for English language release in North America by Kodansha USA, who published the first volume on March 11, 2014. As the series is published in Japan, it is also released simultaneously in English digitally by Crunchyroll in over 170 countries. A special issue of Weekly Shōnen Magazine, published on October 19, 2013, featured a small crossover between The Seven Deadly Sins and Hiro Mashima's Fairy Tail, where each artist drew a yonkoma (four-panel comic) of the other's series. An actual crossover chapter between the two ran in the magazine's combined 4/5 issue of 2014, which was released on December 25, 2013. Nakaba wrote a one-shot for the November 2014 issue of the shōjo manga magazine Nakayoshi, released on October 3, 2014. He also created a comedic one-shot depicting how Meliodas and Hawk first met that ran in the October 20, 2014 issue of Magazine Special. From February 24 to May 10, 2015, two more spin-off manga by Nakaba were available on the smartphone and tablet application Manga Box. Naku na, Tomo yo (泣くな 友よ, "Do Not Cry, My Friend") is about Hendrickson and Dreyfus' younger years, while Gilthunder no Shinjitsu (ギルサンダーの真実, "Gilthunder's Truth") is set after the Vaizel Fight Festival arc and follows Gilthunder. An original 40-page manga by Nakaba Suzuki will be distributed during screenings of The Seven Deadly Sins the Movie: Prisoners of the Sky movie. A comedic spin-off series by Juichi Yamaki, titled Mayoe! The Seven Deadly Sins Academy! (迷え！七つの大罪学園！, Mayoe! Nanatsu no Taizai Gakuen!) and imagining the characters as high school students, ran in Bessatsu Shōnen Magazine from August 9, 2014 to October 8, 2016. It was collected into four tankōbon volumes. The Seven Deadly Sins Production (七つの大罪プロダクション, Nanatsu no Taizai Purodakushon), a comedic spin-off by Chiemi Sakamoto that imagines the characters as actors performing in a live-action TV show, ran in Aria from November 28, 2015 to October 28, 2017. It was collected into four tankōbon volumes. A comedic yonkoma titled The Seven Deadly Sins: King's Road to Manga (七つの大罪 キングの漫画道, Nanatsu no Taizai Kingu no Manga Michi) and written by Masataka Ono that depicts King as an aspiring manga artist, began on February 20, 2016 in Magazine Special before transferring to the Manga Box app on February 1, 2017 and ending later that year. Its chapters were collected into three tankōbon volumes. A manga adaptation of Mamoru Iwasa's novel Seven Days was serialized in Shōnen Magazine Edge from January 17 to September 2017 and shows how Ban and Elaine met in more detail. It is illustrated by Yō Kokukuji, titled The Seven Deadly Sins: Seven Days ~The Thief and the Holy Girl~ (七つの大罪 セブンデイズ～盗賊と聖少女～, Nanatsu no Taizai: Sebun Deizu ~Tōzoku to Seishōjo~) and was collected into two tankōbon volumes. 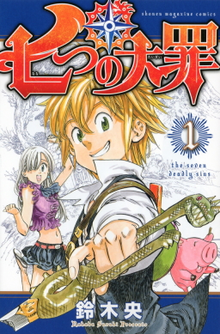 In April 2014, the 20th issue of Weekly Shōnen Magazine announced that The Seven Deadly Sins was being adapted into an anime television series. The series debuted on MBS and other Japan News Network stations on October 5, 2014. The staff was revealed in the combined 36/37 issue of the year: created by A-1 Pictures, directed by Tensai Okamura, written by Shōtarō Suga (Lagrange: The Flower of Rin-ne), with Keigo Sasaki (Blue Exorcist) providing character designs and Hiroyuki Sawano composing the music. The show's first opening theme song is "Netsujō no Spectrum" (熱情のスペクトラム, Netsujō no Supekutoramu, "Spectrum of Passion") performed by Ikimono-gakari for the first twelve episodes and the second opening theme is "Seven Deadly Sins" performed by Man with a Mission, while the first ending theme titled "7-Seven" is a collaboration between Flow and Granrodeo, the second ending theme from episode thirteen onwards is "Season" the major label debut of Alisa Takigawa. A second anime series was confirmed on September 27, 2015 to air in 2016. This turned out to be a four-week anime television special featuring an original story by Nakaba Suzuki, titled The Seven Deadly Sins: Signs of Holy War (七つの大罪 聖戦の予兆, Nanatsu no Taizai: Seisen no Shirushi), that began airing on August 28, 2016 on MBS and TBS. The special was produced by A-1 Pictures, directed by Tomokazu Tokoro, and written by Yuniko Ayana and Yuichiro Kido, featuring character designs by Keigo Sasaki. The music was composed by Hiroyuki Sawano and Takafumi Wada. Its opening theme song is "Classic" by the rock band Mucc and its ending theme is "Iroasenai Hitomi" (色褪せない瞳) by Alisa Takigawa. A commercial following the final episode confirmed a second anime series has been green-lit. The first The Seven Deadly Sins anime series was licensed for English release by Netflix as its second exclusive anime, following their acquisition of Knights of Sidonia. All 24 episodes were released on November 1, 2015 in both subtitled or English dub formats. The Signs of Holy War arc, labeled as "Season 2", has also been licensed by Netflix and was released on February 17, 2017. On February 14, 2017, Funimation announced that they acquired the first anime for home video distribution for US and Canada and released the series on Blu-ray and DVD later in the year. Part One of the first season was released on Blu-Ray on May 15th, 2017 with Part Two being released June 20th the same year. The complete entirety of the first season was released on August 14th, 2018. Madman Entertainment is importing Funimation's release into Australia and New Zealand, with a release scheduled for January 2019. A second season, titled The Seven Deadly Sins: Revival of The Commandments (七つの大罪 戒めの復活, Nanatsu no Taizai: Imashime no Fukkatsu), was announced at the "Nanatsu no Taizai FES" event in July 2017 and premiered on January 13, 2018. Takeshi Furuta and Takao Yoshioka replaced Tensai Okamura and Shōtarō Suga as director and series composer, respectively, while the other main staff members returned from the first season to reprise their roles. The Revival of the Commandments arc, labeled as "Season 3", was released on October 15, 2018 on Netflix. A third season, titled The Seven Deadly Sins: Wrath of the Gods (七つの大罪 神々の逆鱗, Nanatsu no Taizai: Kamigami no Gekirin) was announced, and is set to premiere on October 2019. The new season will be headed towards the story's climax. The third season will be animated by Studio Deen with Susumu Nishizawa and Rintarō Ikeda replacing Takeshi Furuta and Takao Yoshioka as director and series composer, respectively. Hiroyuki Sawano, Kohta Yamamoto, and Takafumi Wada are returning to reprise their roles as the music composers. An original video animation (OVA) titled "Ban's Additional Chapter" (バンの番外編, Ban no Bangai-hen) was included with the limited edition of volume 15 of the manga, released on June 17, 2015. A second OVA composed of nine humorous shorts was shipped with the limited edition of the sixteenth volume of the manga, released on August 12, 2015. An anime film, titled The Seven Deadly Sins the Movie: Prisoners of the Sky (劇場版 七つの大罪 天空の囚われ人, Gekijō-ban Nanatsu no Taizai Tenkū no Torawarebito), premiered in Japanese theaters on August 18, 2018. It is directed by Yasuto Nishikata and written by Makoto Uezu, featuring an original story by Nakaba Suzuki and Noriyuki Abe serving as chief director. The other main staff members returned from the anime series to reprise their roles in the film. The movie features three original characters called Sorada (voiced by Tsubasa Yonaga), Elatte (voiced by Haruka Tomatsu), and Bellion (voiced by Toshiyuki Morikawa). It was released later by Netflix in all regions on December 31, 2018. A video game titled Seven Deadly Sins: Unjust Sin (七つの大罪 真実の冤罪, Nanatsu no Taizai Shinjitsu no Enzai) was developed by Bandai Namco Entertainment and released for the Nintendo 3DS on February 11, 2015. A game titled The Seven Deadly Sins: Knights of Britannia (七つの大罪 ブリタニアの旅人, Nanatsu no Taizai: Buritania no Tabibito) was developed by Bandai Namco for the PlayStation 4. It was released in North America and Europe on February 9, 2018. Four light novels based on The Seven Deadly Sins have been published; The Seven Deadly Sins -Gaiden- The Seven Wishes of the Royal City from Old Times (七つの大罪　―外伝―　昔日の王都　七つの願い, Nanatsu no Taizai -Gaiden- Sekijitsu no Ōto Nanatsu no Negai) by Shuka Matsuda on December 17, 2014; The Seven Deadly Sins: Seven Days (七つの大罪　セブンデイズ, Nanatsu no Taizai Sebun Deizu) by Mamoru Iwasa on December 26, 2014; The Seven Deadly Sins: Seven Scars They Left Behind (七つの大罪　―外伝―　彼らが残した七つの傷跡, Nanatsu no Taizai -Gaiden- Karera ga Nokoshita Nanatsu no Kizuato) by Shuka Matsuda on October 16, 2015; and The Seven Deadly Sins: Seven-Colored Recollections (七つの大罪 ―外伝― 七色の追憶, Nanatsu no Taizai -Gaiden- Nanairo no Tsuioku) by Shuka Matsuda on October 17, 2016. Vertical released Seven Scars They Left Behind in North America in May 2017, with Seven-Colored Recollections set to follow in March 2018. An illustration collection titled Rainbow of Sin (七色の罪, Nanairo no Tsumi) and an official fan book were both released on February 17, 2015, while a guidebook for the anime called Ani-Sin (アニ罪, Ani-Tsumi) was released on April 17, 2015. As of August 2014, the collected volumes of The Seven Deadly Sins had 5 million copies in circulation. By January 2015, this number had grown to 10 million sold. As of 2018, the series has 28 million copies in circulation. The first collected volume of the series sold 38,581 copies in its first week, ranking number 13 on the Oricon manga chart. Its second volume ranked 5 selling 106,829 in its first week, while its third debuted at number 4 with 135,164 copies. The thirteenth volume had the manga's best debut week to date, selling 442,492 for first place on the chart. The series was the ninth best-selling manga of 2014, with over 4.6 million copies sold that year. For the first half of 2015, The Seven Deadly Sins was the number one best-selling series. It finished the year in second place with over 10.3 million copies sold, behind only One Piece. It was the sixth best-selling of 2016, with over 5 million copies sold, and the seventh of 2017, with close to 3.6 million copies sold. The 2014 edition of Kono Manga ga Sugoi!, which surveys people in the manga and publishing industry, named The Seven Deadly Sins the fifth best manga series for male readers. The title was named Best Shōnen Manga at the 39th Kodansha Manga Awards alongside Yowamushi Pedal. It was also nominated for the 2014 Manga Taishō award and as Best Youth Comic at the 42nd Angoulême International Comics Festival in France. The North American releases of volumes two and four charted on The New York Times Manga Best Seller list at number seven and nine respectively. Rebecca Silverman of Anime News Network (ANN) gave the first volume a B grade, calling the art interesting and the story a "neat take on the basic knights-in-shining-armor." She saw influence from Akira Toriyama in Meliodas and 1970s shōjo manga in the female characters. However, Silverman felt the art had issues with perspective and commented that Elizabeth lacked character development. Both Silverman and Danica Davidson of Otaku USA warned that Meliodas' perverted actions towards Elizabeth, which are used for comedic relief, could possibly be misinterpreted by some readers. In a brief review, Jason Thompson claimed that the series follows common shōnen manga elements, making its plot twists and dialog predictable. He did however like the art and the series' European setting. The first DVD volume of the anime debuted at number one on Oricon's Japanese animation DVD chart with 3,574 copies sold. With 32,762 copies sold of the five volumes released at the time, The Seven Deadly Sins was the 30th best-selling anime of the first half of 2015. Reviewing the first anime for ANN, Theron Martin felt that the series has a slow start with generic shōnen action fare but the storytelling picks up significantly in the second half. He had strong praise for the music and enjoyed the main cast and their interactions, but not the common archetypal villains. Martin noted that the art has a "semi-cartoonish look" that one would expect in a series that "skews a bit younger," but The Seven Deadly Sins' graphic violence and minimal fan service prove its "anything but a kiddie show." The novel The Seven Deadly Sins -Gaiden- Sekijitsu no Ōto Nanatsu no Negai was the 33rd best-selling light novel of the first half of 2015, with 61,939 copies sold. In October 2017, Netflix revealed that The Seven Deadly Sins anime was the fourth most binge-watched show within its first 24 hours of release on their platform. ^ "The Seven Deadly Sins". Funimation. Retrieved June 28, 2018. ^ "No.52 2011年11月22日（火）発売" (in Japanese). Kodansha. Archived from the original on November 10, 2013. Retrieved November 9, 2013. ^ 七つの大罪 (in Japanese). Kodansha. Retrieved 2016-03-02. ^ "The Seven Deadly Sins Manga's 1st of 3 Planned Arcs Ends". Anime News Network. 2015-01-19. Retrieved 2015-01-20. ^ "Kodansha Comics Adds UQ Holder, Seven Deadly Sins Manga". Anime News Network. 2013-10-11. Retrieved 2013-11-04. ^ "The Seven Deadly Sins Volume 1". Amazon.com. Retrieved 2013-11-04. ^ "CRUNCHYROLL LAUNCHES "CRUNCHYROLL MANGA" DIGITAL COMIC PLATFORM". Crunchyroll. 2013-10-30. Retrieved 2013-11-04. ^ "Crunchyroll to Simultaneously Offer Kodansha Manga in 170 Countries". Anime News Network. 2013-10-26. Retrieved 2013-11-08. ^ "鈴木央が「FAIRY TAIL」、真島ヒロが「七つの大罪」を執筆" (in Japanese). Natalie. 2013-10-19. Retrieved 2013-11-11. ^ "Fairy Tail, The Seven Deadly Sins Get Crossover 1-Shot Manga". Anime News Network. 2013-12-06. Retrieved 2013-12-06. ^ "The Seven Deadly Sins Gets One-Shot in Nakayoshi Magazine For Girls". Anime News Network. 2014-09-03. Retrieved 2014-09-03. ^ "The Seven Deadly Sins Manga Gets Comedy 1-Shot Story". Anime News Network. 2014-09-20. Retrieved 2014-09-21. ^ "The Seven Deadly Sins' 2nd New Spinoff Manga by Creator Posted". Anime News Network. 2015-02-26. Retrieved 2015-02-26. ^ "Seven Deadly Sins – Prisoner of the Sky Reveals Present for Cinema Goers". MANGA.TOKYO. July 2, 2018. Retrieved July 2, 2018. ^ "The Seven Deadly Sins Gets School Comedy Manga Spinoff". Anime News Network. 2014-06-29. Retrieved 2014-06-29. ^ "The Seven Deadly Sins' Spinoff Manga Mayoe! Nanatsu no Taizai Gakuen! Ends". Anime News Network. 2016-10-09. Retrieved 2016-10-09. ^ ""Seven Deadly Sins" Inspires Shoujo Parody Spin-Off". Crunchyroll. 2015-11-28. Retrieved 2015-12-05. ^ "Seven Deadly Sins Production Manga Reaches 'Climax' in October". Crunchyroll. 2017-09-29. Retrieved 2018-02-04. ^ "Seven Deadly Sins' 4-Panel Spinoff Reimagines King as Aspiring Manga Creator". Anime News Network. 2016-01-19. Retrieved 2016-01-19. ^ "Seven Deadly Sins Spinoff Manga King no Manga Michi Ends With 3rd Volume". Anime News Network. 2017-06-16. Retrieved 2018-02-04. ^ "Seven Deadly Sins Spinoff Manga About Ban & Elaine Ends in September". Anime News Network. 2017-08-18. Retrieved 2018-02-04. ^ "The Seven Deadly Sins Fantasy Manga Gets TV Anime". Anime News Network. 2014-04-11. Retrieved 2014-04-11. ^ "「七つの大罪」TVアニメ化決定！単行本は累計300万部突破" (in Japanese). Natalie. 2014-04-16. Retrieved 2014-07-27. ^ アニメ「七つの大罪」10月より日5枠で放送 (in Japanese). Natalie. 2014-07-27. Retrieved 2014-07-27. ^ "The Seven Deadly Sins Anime Commercial Streamed". Anime News Network. 2014-07-27. Retrieved 2014-07-27. ^ "The Seven Deadly Sins Anime's Game, Cast, Staff Announced". Anime News Network. 2014-08-01. Retrieved 2014-08-03. ^ a b c "The Seven Deadly Sins Anime's Theme Songs, Game Detailed". Anime News Network. 2014-08-12. Retrieved 2014-08-12. ^ "Man With A Mission, Alisa Takigawa Perform The Seven Deadly Sins' New Songs". Anime News Network. 2014-12-21. Retrieved 2015-01-19. ^ "The Seven Deadly Sins Manga Gets New TV Anime in 2016". Anime News Network. 2015-09-29. Retrieved 2015-09-29. ^ "The Seven Deadly Sins: Signs of holy war 4-Episode Special Premieres on August 28". Anime News Network. 2016-05-10. Retrieved 2016-05-10. ^ "Seven Deadly Sins Gets 4-Week TV Anime Special In August With Brand-New Story". Anime News Network. 2016-03-27. Retrieved 2016-03-27. ^ "The Seven Deadly Sins -Signs of Holy War- TV Special's Ad Previews Opening Theme Song". Anime News Network. 2016-08-09. Retrieved 2017-02-26. ^ "The Seven Deadly Sins Manga's Next TV Anime Series Teases New Adventures in Ad". Anime News Network. 2016-09-18. Retrieved 2017-02-26. ^ Newman, Heather (2015-10-09). "Netflix To Announce Its Second Exclusive Anime Series Tomorrow: 'The Seven Deadly Sins'". Forbes. Retrieved 2015-10-13. ^ "Netflix to Stream The Seven Deadly Sins Anime's 'Season 2' in February". Anime News Network. January 26, 2017. Retrieved January 28, 2017. ^ "Funimation Acquires Home Video Rights for Seven Deadly Sins". Anime News Network. February 14, 2017. Retrieved February 14, 2017. ^ "Seven Deadly Sins Season 1 (Eps 1-24) (Blu-Ray)". Madman Entertainment. Retrieved October 28, 2018. ^ "Seven Deadly Sins Anime Reveals New Season's January 2018 Premiere, Title, Cast, Staff, Visual, Trailer". Anime News Network. July 16, 2017. Retrieved July 16, 2017. ^ Ressler, Karen (2018-09-26). "Netflix U.S. Sets Violet Evergarden Special Episode, Seven Deadly Sins Season 2 Premiere Dates for October". Anime News Network. Retrieved 2018-09-27. ^ "The Seven Deadly Sins Anime Gets Fall TV Show to 'Head Toward Climax' With New Studio". Anime News Network. April 9, 2019. Retrieved April 9, 2019. ^ "The Seven Deadly Sins 'Season 4' release date confirmed for 2019: Nanatsu no Taizai Season 3 called Kamigami no Gekirin (Wrath of the Gods) – Manga compared to the anime [Spoilers]". Monsters and Critics. April 10, 2019. Retrieved April 10, 2019. ^ "The Seven Deadly Sins Manga to Bundle OVA Episode About Ban". Anime News Network. 2015-03-16. Retrieved 2015-03-16. ^ "2nd Seven Deadly Sins OVA to Compile 9 Short Stories". Anime News Network. 2015-05-11. Retrieved 2015-05-11. ^ "Seven Deadly Sins Gets Anime Film in Summer 2018". Anime News Network. July 16, 2017. Retrieved July 16, 2017. ^ "Seven Deadly Sins Film Reveals Teaser Video, Visual, August 18 Release". Anime News Network. February 15, 2018. Retrieved February 15, 2018. ^ "Seven Deadly Sins Movie Reveals Visual and more". MANGA.TOKYO. April 16, 2018. Retrieved April 16, 2018. ^ "Netflix Adds Pokemon and Seven Deadly Sins Films". Anime News Network. January 1, 2019. Retrieved January 1, 2019. ^ "Nakaba Suzuki's The Seven Deadly Sins Manga Gets PS4 Action Game". Anime News Network. June 26, 2017. Retrieved June 26, 2017. ^ "The Seven Deadly Sins: Knights of Britannia PS4 Game Gets U.S. Release in Early 2018". Anime News Network. July 1, 2017. Retrieved July 1, 2017. ^ Romano, Sal (July 3, 2017). "The Seven Deadly Sins: Knights of Britannia coming to Europe in early 2018". Gematsu. Retrieved July 3, 2017. ^ 小説　七つの大罪　―外伝―　昔日の王都　七つの願い (in Japanese). Kodansha. Retrieved 2015-06-29. ^ 七つの大罪　セブンデイズ (in Japanese). Kodansha. Retrieved 2014-06-29. ^ 小説　七つの大罪　―外伝―　彼らが残した七つの傷跡 (in Japanese). Kodansha. Retrieved 2015-12-01. ^ 小説　七つの大罪　―外伝―　七色の追憶 (in Japanese). Kodansha. Retrieved 2018-02-05. ^ "Vertical to Release The Seven Deadly Sins: The Seven Scars Left Behind Novel". Anime News Network. 2016-08-13. Retrieved 2016-08-13. ^ 七つの大罪　イラストコレクション　〈七色の罪〉 (in Japanese). Kodansha. Retrieved 2014-06-29. ^ 七つの大罪　公式ファンブック　解体罪書 (in Japanese). Kodansha. Retrieved 2014-06-29. ^ 七つの大罪　公式アニメガイド　アニ罪 (in Japanese). Kodansha. Retrieved 2014-06-29. ^ "The Seven Deadly Sins Manga's 1st of 3 Planned Arcs Ends". Anime News Network. 2015-01-19. Retrieved 2015-01-19. ^ "「七つの大罪」鈴木央先生描き下ろしのオリジナルストーリーブック付き！" (in Japanese). PR Times. 2018-06-15. Retrieved 2018-08-08. ^ "Japanese Comic Ranking, February 11–17". Anime News Network. 2013-02-20. Retrieved 2013-11-10. ^ "Japanese Comic Ranking, April 15–21". Anime News Network. 2013-04-24. Retrieved 2013-11-08. ^ "Japanese Comic Ranking, June 17–23". Anime News Network. 2013-06-26. Retrieved 2013-11-08. ^ "Japanese Comic Ranking, February 16–22". Anime News Network. 2015-02-25. Retrieved 2015-05-11. ^ "Top-Selling Manga in Japan by Series: 2014". Anime News Network. 2014-11-30. Retrieved 2014-11-30. ^ "Top-Selling Manga in Japan by Series: 2015 (First Half)". Anime News Network. 2015-05-31. Retrieved 2015-06-01. ^ "Top-Selling Manga in Japan by Series: 2015". Anime News Network. 2015-11-29. Retrieved 2015-11-29. ^ "Top-Selling Manga in Japan by Series: 2016". Anime News Network. 2016-11-30. Retrieved 2016-11-30. ^ "Top-Selling Manga in Japan by Series: 2017". Anime News Network. 2017-12-06. Retrieved 2017-12-06. ^ "Top Manga Ranked by Kono Manga ga Sugoi 2014 Voters". Anime News Network. 2013-12-09. Retrieved 2013-12-09. ^ "Yowamushi Pedal, The Seven Deadly Sins Win 39th Kodansha Manga Awards". Anime News Network. 2015-05-12. Retrieved 2015-05-12. ^ "10 Titles Nominated for 7th Manga Taisho Awards". Anime News Network. 2014-01-20. Retrieved 2014-01-20. ^ "Akira's Katsuhiro Otomo Wins Angoulême's Top Prize". Anime News Network. 2015-01-29. Retrieved 2015-01-29. ^ "New York Times Manga Best Seller List, May 11–17". Anime News Network. 2014-05-23. Retrieved 2014-05-23. ^ "New York Times Manga Best Seller List, September 14–20". Anime News Network. 2014-09-26. Retrieved 2014-09-26. ^ a b "The Seven Deadly Sins GN 1 - Review". Anime News Network. 2014-05-15. Retrieved 2014-06-29. ^ "The Seven Deadly Sins Manga #1". Otaku USA. 2014-04-14. Retrieved 2014-06-29. ^ "House of 1000 Manga - Crunchyroll Manga". Anime News Network. 2013-11-14. Retrieved 2013-11-14. ^ "Japan's Animation DVD Ranking, January 26-February 1". Anime News Network. 2015-02-03. Retrieved 2015-06-29. ^ "Top-Selling Animation in Japan by Title: 2015 (First Half)". Anime News Network. 2015-06-17. Retrieved 2015-06-29. ^ "The Seven Deadly Sins - Review". Anime News Network. 2015-11-20. Retrieved 2017-02-26. ^ "Top-Selling Light Novels in Japan by Volume: 2015 (First Half)". Anime News Network. 2015-06-02. Retrieved 2015-06-29. ^ "Ready, Set, Binge: More Than 8 Million Viewers 'Binge Race' Their Favorite Series". Netflix Media Center. Netflix. 17 October 2017. Retrieved 1 March 2019.